Berlin between the two world wars is the capital of crime. This is where two worlds meet: while families with many children crowd together in back-yard slums, the metropolis is also notorious for its glamourous nightlife. In the city with its population of four million, in which the morality of the days of the German Empire have been thrown overboard, prostitution, robbery and murder are booming. 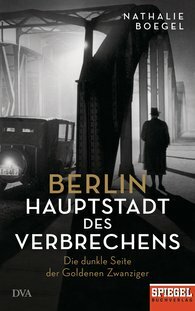 Against the setting of vibrant city life and the political turmoil of the time, Nathalie Boegel tells tales of the most spectacular crime cases in Berlin's wildest years. She reports on perpetrators and victims and describes the work of investigators, forensic scientists and attorneys trying to put an end to the hotbed of vice in Berlin and who in the process revolutionise police work. "A riveting look at the 1920s."